Juniper Berries are small white berries harvested from juniper, which is a small tree found growing in the Reach. Although the player cannot use juniper berries in cooking, they are used in baking the juniper berry crostataHF. NPCs mention uses such as mixing berries into mead to add extra flavor. As a result, juniper berries are also categorized as raw food, meaning they can be sold to innkeepers as well as apothecary merchants. 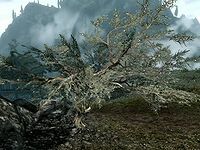 Elmus Favor QuestDB: Retrieve some juniper berries for Elmus. This page was last modified on 4 September 2018, at 01:09.